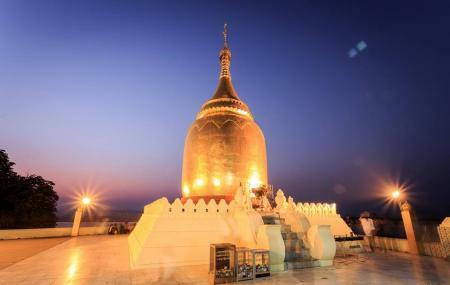 On the banks of Ayeyarwady river, lies a notable Pagoda with the name of Buphaya Paya. Built by the third king of Pagan, the dome of the pagoda is bulbous shaped. While the original pagoda was destroyed completely in the 1975 earthquake, still it was rebuilt again with the use of modern techniques. Hence, this one is an addition to the list of remains of pagodas which are located across Bagan. Overall, a great place for every history lover! How popular is Buphaya Paya? People normally club together Thatbyinnyu Temple and Gubyaukgyi Temple while planning their visit to Buphaya Paya. Bu Paya is located in Ayerwaddy river shore. So, travellers in river can see vividly. It is a historical Pagoda, popular for tourists and local public. A small pagoda when compared to the other temples in the region. But that doesn't undermine its significance in any way. Situated next to the Irrawaddy river, this ancient pagoda has a slightly bell shaped casket like structure. Adjacent to it is a shrine dedicated to the holy spirit ,'Nat' , of the storms. Bu paya is clearly visible to a large distance down the river. Good to visit here at sunset time. Sunset view is good from here.